"What would happen when we leave the EU? ", Charles Moore asks, cautioning us that we must know the meaning of "no". Well, in this context, "no" does not mean opting what is known as the "Swiss option", despite the enthusiasm of Ukip and others for citing Switzerland as an example we should follow. That much we've already rehearsed at length in Flexcit and again more recently on the blog, warning that there are too many problems for this to be a safe option. But, it seems, there is nothing like a eurosceptic with a death wish, as we seek the likes of William Dartmouth extol the virtues of Switzerland's status outside the EU, thus leaving us wide open to serial debunking from informed Europhiles. 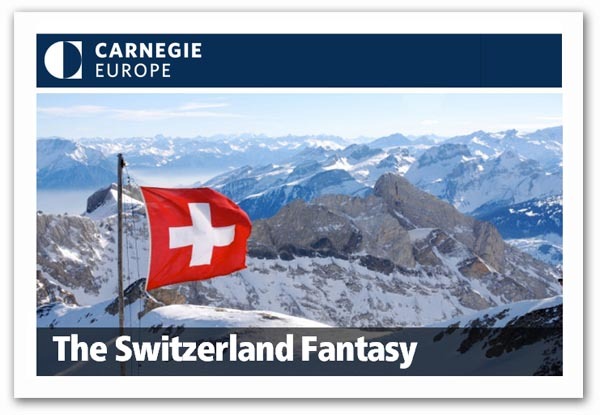 One such is Caroline de Gruyter, correspondent for NRC Handelsblad in Vienna who writes for Carnegie Europe, lending such journalistic skill as she can muster to demolishing idea that we should rely on the "Swiss option" as an alternative to EU membership. The British enthusiasm for the option is noted by de Gruyter, but it is shared by Geert Wilders who, speaking of the Netherlands, says "Switzerland is the example". Similarly, Germany's Pegida movement repeatedly singles out Switzerland in its manifesto as an example to follow. But, avers de Gruyter, "Switzerland is essentially as dependent on Brussels as EU countries are. In fact, the Alpine country is losing as much sovereignty and democratic impact as EU members". The problem, she thinks, "is not Brussels. It is globalisation". As a nation with one of the world's most open economies, she argues that Switzerland increasingly has to play by global rules. Those rules are not set in Bern. After fierce battles with the US tax authorities in recent years, the Swiss have de facto given up their banking secrecy, which is enshrined in the country's constitution. If they had not handed over thousands of bank files on American citizens, Swiss banking giants UBS and Credit Suisse would have lost their license to do business on Wall Street. Without this license, a bank cannot trade in dollars - in other words, it is dead. Washington presented Bern with a clear-cut choice: Either play the global game and have the world’s biggest banks, or play the sovereign game and shield foreign bank clients in your country. You can no longer have it both ways - especially as a small country. Switzerland, de Gruyter claims, was once was a safe haven for dictators' fortunes, but it is no more. Bern now clamps down on money launderers and scrutinizes politically exposed individuals. And after the recent US crackdown on FIFA the Swiss Federal Parliament has agreed to change a decades-old law that exempts sports associations from scrutiny. Almost half of Switzerland's imports come from Germany, Italy, or France. The Swiss said "no" to joining the EEA in a referendum in 1992, but they need access to the EU's internal market, which completely surrounds their country. So Bern has concluded many bilateral treaties with Brussels that require Switzerland to adhere to the basic rules governing the internal market - free movement of goods, people, capital, and services. In February 2014, however, the Swiss voted in a referendum to impose restrictive quotas for foreigners wishing to live in Switzerland. The Swiss feel swamped, even though 85 percent of these foreigners are Europeans, mostly well-educated, such as German engineers or French doctors, on whom the Swiss economy depends. To this day, the Swiss Government still has not reconciled the referendum result with the EU free movement agreement. On a broader front, though, she asserts that the Federal Parliament has to draft most legislation in such a way that Swiss companies have access to the EU's internal market without facing two incompatible sets of rules. This, she claims, is, "just like Norway", raising the tired old spectre of the "fax economy". If de Gruyter is able to convince her own kind with this low drone, so be it – but the argument has increasing traction with the British people, by dint of constant repetition. But she is not wholly wrong when she asserts that, because the Swiss need to apply so many global rules and EU regulations, their self-rule is compromised. Many Swiss citizens, she says, find their country's system of direct democracy is not functioning as it used to. Voter turnout in general is below 50 percent, far lower than in most EU member states. Ten years ago, several villages around Geneva reported that turnout for a referendum had declined to 30–40 percent, with the Swiss People's Party ahead nearly everywhere. A former village mayor, de Gruyter says, conceded that Swiss locals had become rich by selling vineyards to multinational companies and by renting out houses to the new globalised middle class. But another official complains that the government was ignoring the Swiss refusal to join the EU: "It doesn't matter how we vote. Every year, we get more EU regulation via the back door". From all this, de Gruyter asserts that, "those who claim that certain EU member states should leave the union and be like Switzerland are deceiving the electorate". Switzerland, she says, "has the same problem as EU countries: a considerable loss of sovereignty". In what she obvious feels is the killer point, she then tells us: "the cause is not Brussels, but globalisation. Quitting the EU is therefore a false remedy, and it is time those fantasists up north realized that". Speaking personally, I would have made a better job of demolishing the "Swiss option", stressing the tensions building up over the February referendum, and the loss of all the trading agreements under the "guillotine clause", unless freedom of movement is reinstated. The points made about globalisation, however, cut both ways. Much regulation of global origin is actually framed in Switzerland, in Geneva, via such institutions as UNECE and the WTO, or the Basel Committee on Banking Supervision. However, geographical proximity does not necessarily confer privileged access and, in truth, no one country has a complete "handle" on globalisation. More and more, the apparatus of government are becoming remote and obscure – understood by barely a handful of specialists in each country. That is the real reason why the "Swiss option" would never work, in the long term. As with the "Norway option" and EU membership itself, none of these address properly the effects of globalisation. We need an entirely new settlement. In the shorter terms though, it took 14 years for Switzerland to conclude its raft of bilateral agreements with the EU, the sum of which afford fewer rights and access than does the EEA Agreement. We can't afford to sit at the negotiating table for that many years, to get to the same unsatisfactory position that Switzerland occupies, and neither can we trade with the EU without a comprehensive formal agreement. The "Swiss option", therefore, has nothing to offer Britain, and the more we have eurosceptics promote it, the more difficult it will be to win our referendum.